Sure, maybe the name could do with a bit of work, but the flavour should speak for itself! Behold! The Atomic Buffalo Turd. 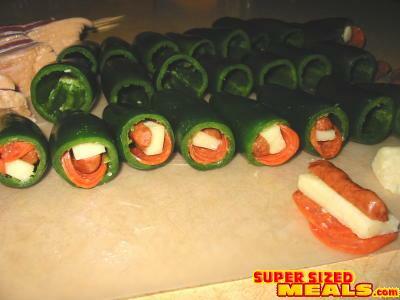 Peppers filled with sausage, pepperoni and cheese, then topped with a little bacon hat. Baked in the oven, these tasty little fat filled snacks spell WIN at parties! ABT's really don't have "A" recipe, they are more of a process. You can put any of your favorite ingredients in them. You can either cut the top of the pepper off and core it, or you can cut the pepper in half lengthwise. 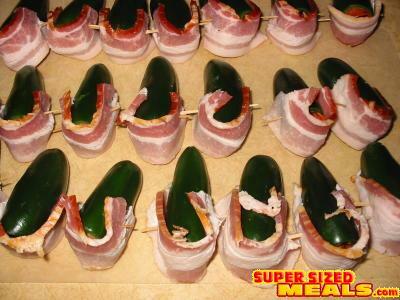 You can wrap the bacon around the pepper or put it on top like a lid. 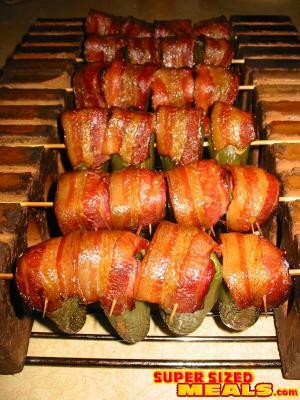 You can grill them indirectly or cook them in a smoker. You want to use cooked meats (shrimp can be raw) inside the pepper because they may not completely cook by the time the bacon is done. The bacon is THE indicator to telling when the ABT's are done. Step 1.) First wash the peppers and assemble the ingredients. There is no end to what you can stuff the babies with. 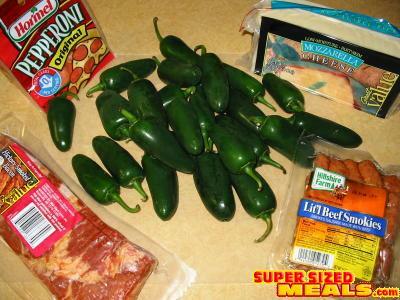 Just grab some of your favorite foods that you enjoy jalapenos on or with to place them inside instead. Step 2.) 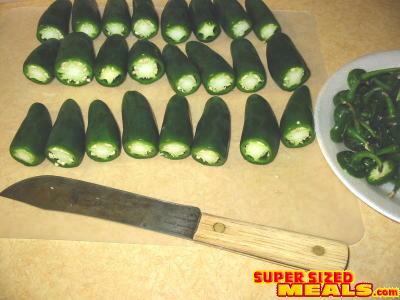 Cut the tops off of the chile with a sharp knife. If your skin is sensitive to peppers you may opt to wear gloves from this point on. And for goodness sakes...keep you hands away from your face! Step 3.) Core the pepper removing the seeds and viens taking care not to damage the side walls of the pepper. I like to use an apple corer to do this. It makes light work of it. Step 4.) Prepare the ingredients for stuffing. 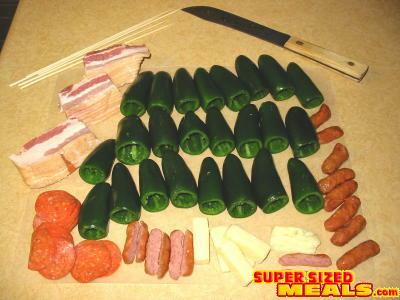 Slice the cheese (no cutting), I halve the little smokies lengthwise, etc. (view #1). Step 4.) Prepare the ingredients for stuffing. 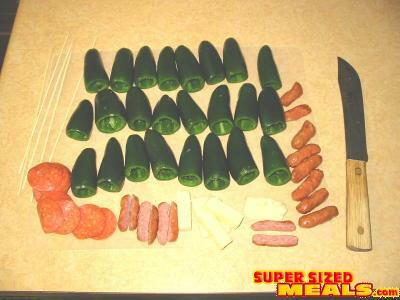 Slice the cheese (no cutting), I halve the little smokies lengthwise, etc. (view #2). Step 4.) Prepare the ingredients for stuffing. 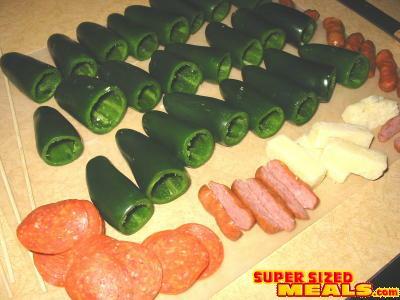 Slice the cheese (no cutting), I halve the little smokies lengthwise, etc. (view #3). Step 5.) 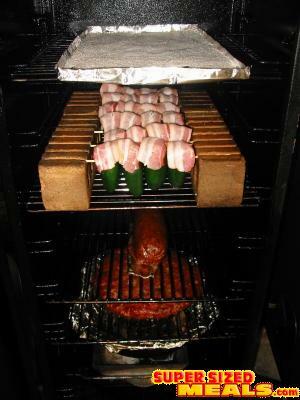 Load the peppers with the goodies. Step 6.) 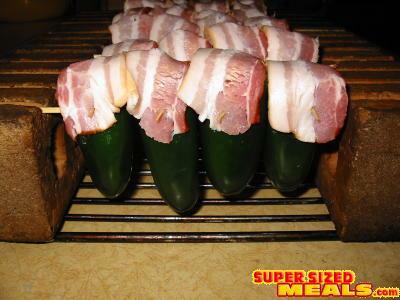 Cap the peppers with a bacon lid and skewer with a toothpick to hold the bacon in place. I use a 1/3 slice of bacon but a 1/2 slice will work if you want more. Step 7.) 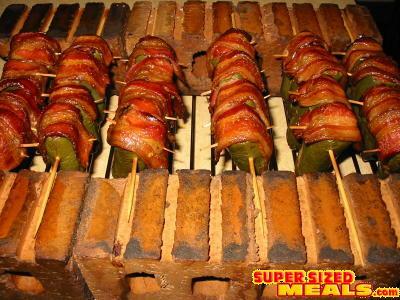 Install the peppers into your grilling contraption (Chile Grill, bricks & sticks, inverted aluminum pan with holes poked in it, or whatever is handy) and get them ready to cook. 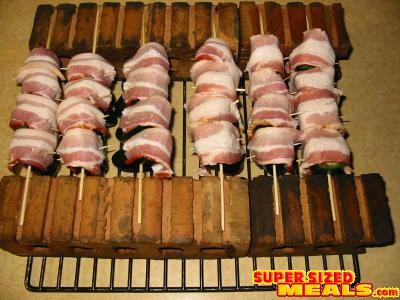 With bricks & sticks I skewer the opposite direction of (perpendicular to) the toothpicks to expose the bacon. Step 7.) Still one more angle...but ain't they worth it??? Step 8.) What are you waiting for? Get a crackin' and cook those puppies! 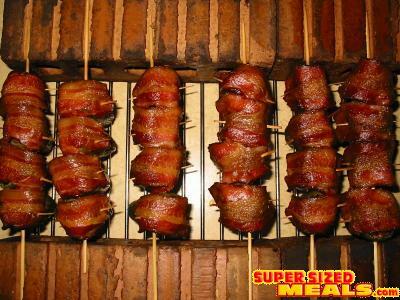 You want to cook them indirectly on a medium heat until the bacon is completely cooked and begins to crisp. 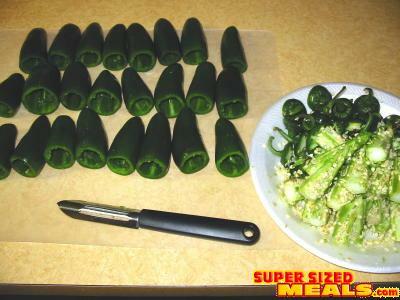 The pepper will be tender but still have some crunch to it and the filling will be warm and melted. Step 9.) 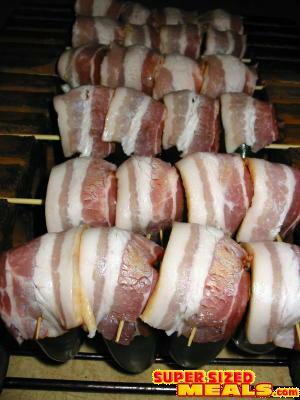 Remove from the grill/smoker when the bacon is cooked and allow to cool a bit (the filling will be hot). Step 9.) While cooling...take a picture to post on the board! Step 10.) Stop taking so many pictures...the peppers are ready to eat!!! Be sure to remind folks that they have a toothpick in them and enjoy.